On board the Black Pearl in The Pirates of the Caribbean: Dead Man's Chest, Jack and Elizabeth get into some touchy subjects. Jack: "You will come over to my side, I know it." Elizabeth: "You seem very certain." Jack: "One word love, curiosity. You long for freedom. You long to do what you want to do because you want it, to act on selfish impulse. You want to see what it's like. One day, you won't be able to resist." Elizabeth: "Why doesn't your compass work?" (Random much?) Jack: "My compass works fine." Elizabeth: "Because you and I are alike. And there will come a moment when you have a chance to show it. To do the right thing." Jack: "I love those moments. I like to wave at them as they pass by." Elizabeth: "You'll have the chance to do something, something courageous. And when you do, you'll discover something. That you're a good man." Jack: "All evidence to the contrary." Elizabeth: "Oh I have faith in you. Want to know why?" Jack: "Do tell dearie." Elizabeth: "Curiosity. You're going to want it, a chance to be admired and gain rewards that follow. You won't be able to resist. You're going to want to know what it tastes like." Jack: "I do want to know what it tastes like." Jack leans in closely to kiss her. She stand there and lets him as a "test", but I think she really wants it as much as he does. Elizabeth: "But seeing that you're a good man I know that you would never put me in a position that would compromise my honor. I'm proud of you Jack." I guess he passed the test. She thinks its because he's a good man, but really its because he saw the black spot grow on his hand. As it turns out, they were both right about each other. As the kraken attacks the Black Pearl, Jack rows away in a row boat, abandoning all his crew mates and friends. But then he comes back to save them again. He shoots the barrels of explosives to buy them more time against the beast. "You came back. I always knew you were a good man." -Elizabeth. Once the kraken is gone for the time being, he instructs everyone to abandon ship. Everyone gets onto the boat, and Jack stays behind to say good bye to his beloved Pearl. Elizabeth goes with him to commit her act of selfishness. As she kisses him, she chains him to the boat, leaving him to the kraken food when it comes back. Jack just smiles when he finds out what she's done. Elizabeth: "It's after you, not the ship. It's not us. It was the only way you see. I'm not sorry." 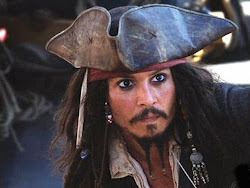 Jack: "Pirate." Curiosity killed the cat. I think she really is sorry because she pretty much cries the rest of the day. When the crew goes to Tia Delma's to lament the loss of Captain Jack Sparrow and the his ship, she toasts: "He was a good man." However James Norrington, her first fiance, seems to know how to read people, (Earlier on he voyage he was curious after watching an encounter between Elizabeth and Jack). Norrington: "It's a curious thing. There was a time when I would have given anything for you to look like that while thinking about me." Elizabeth: "I don't know what you mean." Norrington: "Oh I think you do." Elizabeth: "Oh don't be absurd. I trust him thats all." Is it, Elizabeth? Is it really?